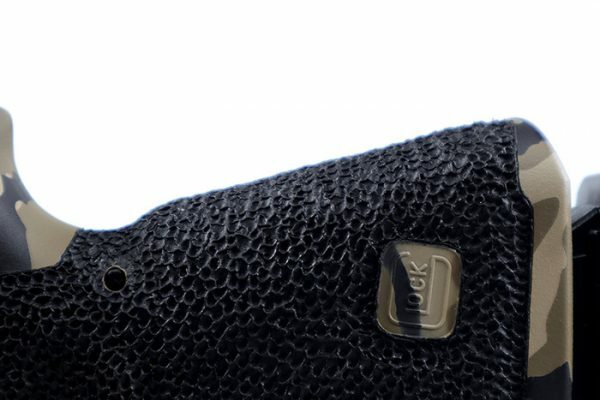 Lava Rock is a stippling pattern that offers great grip without being overly aggressive. It also provides a really unique look for your frame. Chainmail offers more symmetrical look over the many random patterns offered. While being visually appealing to many it is also very practical for carry. It provides an excellent grip without feeling rough. 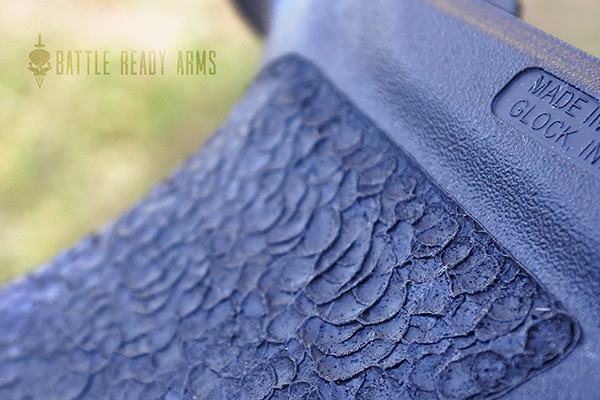 Dragon Skin is one of Battle Ready Arms most popular patterns. The layered semi-geometric look is achieved using a custom tip. It is an excellent choice for concealed carry. It grabs the hand without the need to be rough. Hammered looks like a series of smudged circles. 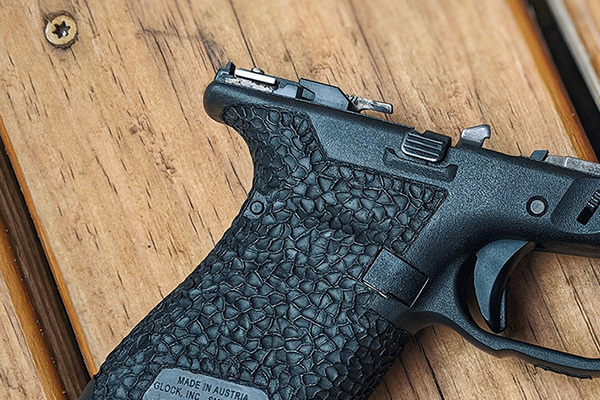 Texturing can be made extremely gentle for concealed carry or quite aggressive. This is a great texture for concealed carry. This pattern is a popular choice due to it being inexpensive while offering an excellent grip. This stippling is rather fine. Larger versions of the pattern may be coming soon. HD Borders create a clear channel between the stippling and the rest of the frame. Some find this look to be more aesthetic. Recessed Borders creates a clean lines around the frame and recesses the stippling so sits approximately flush to frame. Depending on the size of one's hands the Gen 1-3 Glocks can be difficult to release the magazines on. 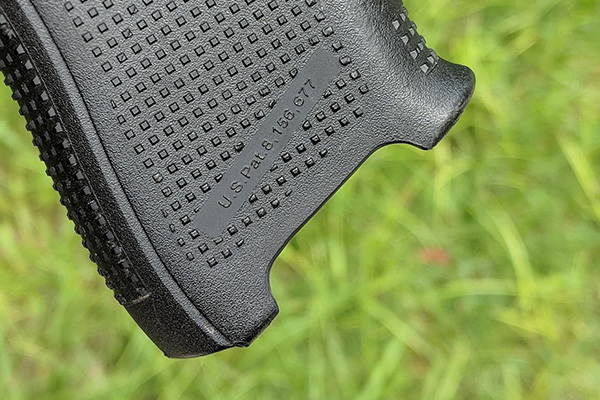 This mod removes material away from the magazine release allowing for easier access to the magazine release which means less shifting of your grip on the frame. 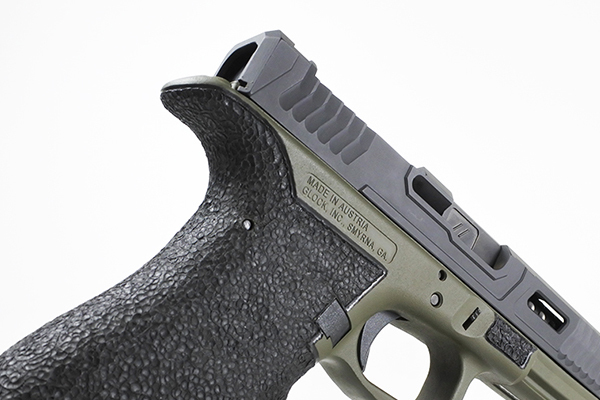 This modification combines the single trigger guard undercut with an additional undercut for the support hand. 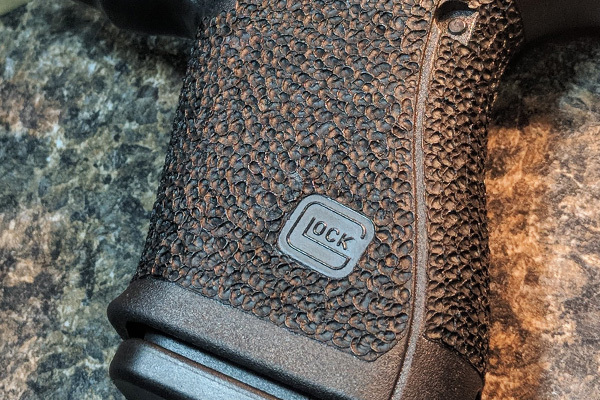 The firing hand undercut allows for a higher grip which improves recoil control, and it also contours and smoothes out the trigger guard to eliminate discomfort know as Glock knuckle. 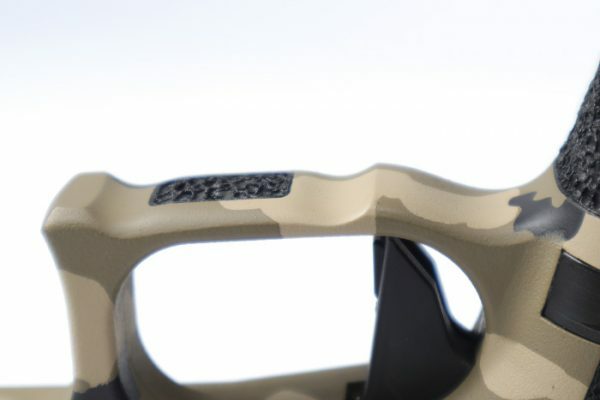 The support hand undercut allows for a higher grip, an index point, and provides the support hand something to brace against and prevents the hand from slipping past the trigger guard. This modification recesses an area behind the trigger and also opens up the inside of the trigger guard. This is helpful for shooters who have gloves or even short fingers. 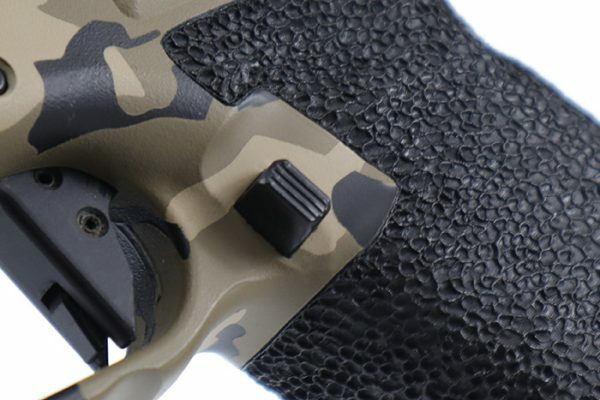 By remove material away from the trigger, it allows for easier access to the trigger face. This is an incredibly comfortable mod. It keeps the hand high into the tang to help optimize your grip for recoil control while simultaneously straightening out the grip. 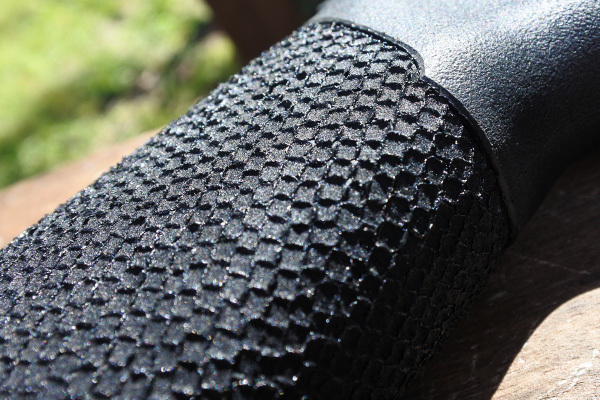 The flat thumb index point provides a texturing for the thumbs to rest on and can be used to help mitigate recoil. The ramped thumb index point provides an angled ledge for the thumbs to rest on. This modification can help mitigate recoil. This is not something I can offer on smaller firearms like the 43 and 42 due to a lack of material. 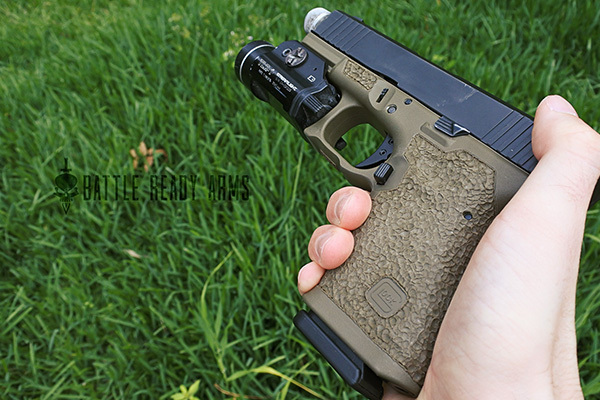 This mod takes a factory backstrap/beaver tail from the Gen 4 Glock and permanently melds and affixes it to the frame. This provides an enlarged beavertail/backstrap for those with larger hands and provides a for a seamless look. Normally, stippling is stopped so the web of the thumb does not make contact. However, with full tang stippling, stippling is brought up almost to the top of the tang. This is not a popular option for many, but it is one some do like. 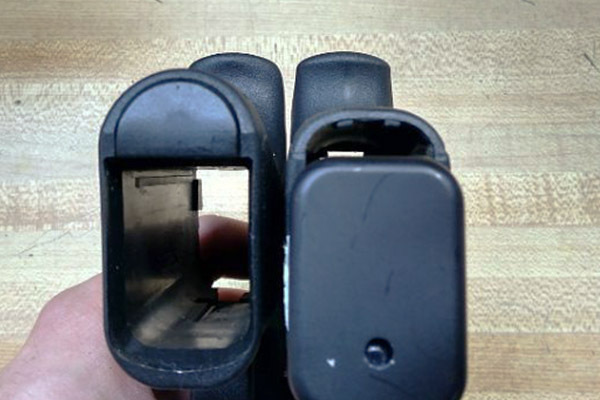 This modification makes the removal of stuck magazines much easier. 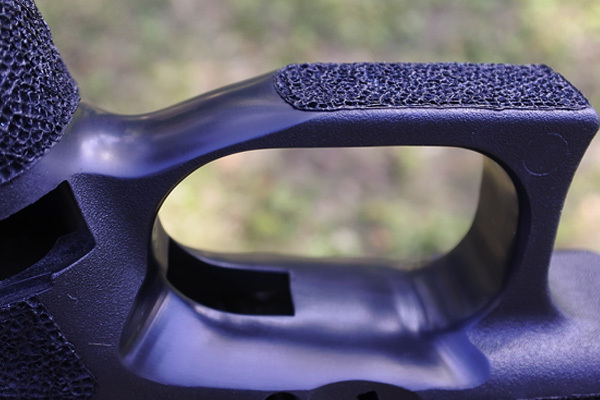 This is a great mod that will provide shooters with the ability to get a firm grip on their magazines and quickly strip magazines that are stuck due to jams or debris. 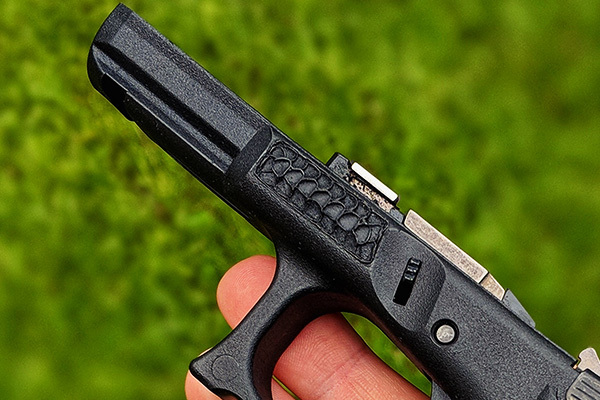 One of the biggest complaints heard from people is that the Glock's grip hump is uncomfortable and causes people to aim upward. This be can be reduced by reducing the hump and straightening out the grip. This modification helps increase the comfort of the grip for some and can also help prevents the upward shift in aim some people experience. *PLEASE NOTE* You cannot use mag wells on your Glock after this modification is done. 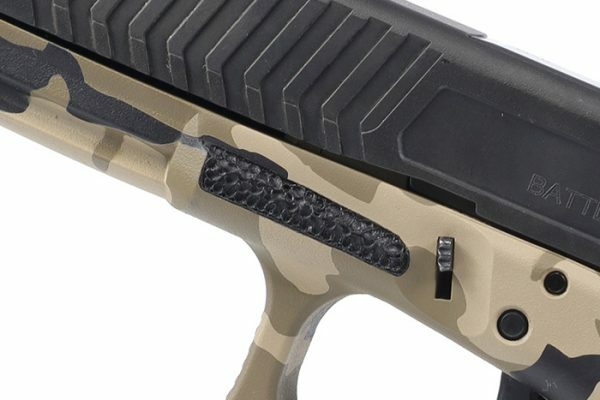 If you run a magazine well on your Glock then opt out of this modification.